I have traveled to a few places and have always done a food-centered blog post when I’ve come back home. I have a post on Miami, Iceland, London/Manchester, and my very first travel post on Italy. It had been a long time since I was in Italy so when I traveled there with the ICCO this past June, I felt that I had a bit of experience in terms of doing a proper blog post. I decided to split up all of the information that I gathered into separate posts so that they would be easier to read. I did a post about all of the cheese, another about all of the meat, another about vermouth, another about Asti and another combining chocolate, coffee and hazelnuts!!! I tried to cover all of the places we visited and all of the food we ate. But, I wanted to do one final post tying the entire trip together, highlighting some of the places we visited that weren’t necessarily covered in my other posts. There were some lovely hotels and some beautiful buildings that I had to show you guys!! Talking about beautiful buildings, I’d be remiss not to tell you about our first stop, Palazzo Righini which was a stunning little hotel in the small town of Fossano. It was so pretty, with painted ceilings everywhere and even a fabulous chapel that was unearthed years later. Antiche Volte is the extraordinary restaurant in the hotel. It was another beautiful find in the hotel. The food was beyond extraordinary and it was stunning! On our first day of adventuring, we went to La Bruna Dairy farms where we learned all about the magnificent local cheese called Castelmagno and all the other glorious cheeses they make (and how hard it is to make it!!). Their cheese cellar below was magnificent! If you want to read more about the cheese of Piedmonte and learn how to make a really simple risotto recipe, click here for a closer look! We visited an agriristoro (a farm that serves lunch) called Cascina Rosa – a lovely farm that grows their own produce, makes their own honey, processes their own preserves, makes their own apple cider vinegar and so much more!!! A simple farm with just a few people on staff, we had the most mouth watering, rustic farm meal!! Crostatina (small crostata) filled with cumin and saffron dusted zucchini, creamed Raschera cheese (a local delicacy) and topped with a deep fried zucchini flower! Served everywhere in Northern Italy, this Russian salad (pickled diced vegetables served in a mayonnaise based “savoury custard”, it was a refreshing surprise! A beautifully rustic dish of homemade gnocchi served in a simple fonduta di Castelmagno di alpeggio, a creamy fondue like sauce made of this magnificent local cheese made from local mountain sheep! And the most lovely end to our meal…cremosa allo yogurt con granola, composta di frutta e frutta fresca – the creamiest yogurt I’ve ever had (would have sworn it was custard!) with a puree of local fruit, homemade granola and fresh fruit! But there are many things that you learn in small town that will also surprise you! Like how popular craft breweries have become in Italy! In the land of vino rosso, the appearance of many craft beers was quite a surprise to me. And what better place to learn all about than at Beer Baladin!! So many beautiful spaces under one roof! I love how they maintained the washed walls of the original building!! We went inside to do some cooking of our own! In the lab we were given the freshest ingredients (from their very own (huge) school garden!!). Look at all of these vegetables that the students get to use in their cooking each day!! We made the most amazing Italian “mac and cheese”…seriously, just macaroni and cheese!! And this tiramisu made with a craft beer (see?!?) that was infused with coffee!!! Amazing! Then we had lunch at the school’s “restaurant”…not cafeteria…restaurant!! We had a fantastic meal (with wine!!). But, seriously, who wouldn’t want to go to school here!! The school even has a luxury hotel right on the premises…I mean, come on!! Stunning!! After the best team building cooking experience, we went to Castiliglione Falletto and did a wine tasting a Cantina Comunale …and incredible educational tasting about so many wines of the region including the fabulous barolo and then continued outdoors to have one of the most beautiful meals with a wine pairing…amazing! What you find all food bloggers doing on assignment…taking pics!! From here we traveled to Asti and did a guided tasting of Asti D.O.G.C Consortium … (and had a great informational session on the great bubbly!!). Visiting the Asti region and learning all about the flavour components of this awesome wine, inspired me to create this strawberry bellini made with asti…such a great summer drink!! From that bubbly tasting, we went to the beautiful Locanda del Bosco Grande, in the untouched hills of Monferrato. I find the simplest of dishes are always the most memorable…like this glorious plate of simple pasta served al fresco on the patio! And a plate of freshly picked asparagus topped with a farm fresh poached egg, beschamel and freshly shaved truffles! There were a few more dishes in between, but I just wanted to bath in this huge bowl (we each got one) of zabaglione with a freshly baked biscuit! Heaven! It was one of many incredible meat dishes we had on out trip. 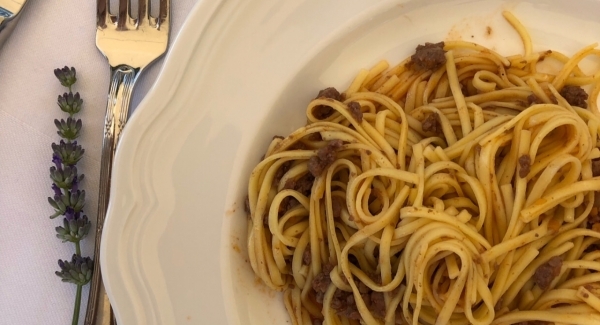 The north historically has always been a wealthier part of the country, which means their food culture has always had things that, to the average Italian would be more costly. The most evident is all of their decadent meat dishes like this brasato which I’ve recreated for all of you to try at home!! I am so intrigued by the simplicity of dishes like gnocchi…full of belly filling goodness! Here is a very northern dish of gnocchi with a white ragu (imagine a tomato-less version of a meat sauce!) that I made at home…inspired by this trip!! Deeeelish!! And I know if you guys were all with me, you would have loved our trip to Affini Bar, where we learned all about Vermouth and the historical significance of it to this region. This is all of my traveling peeps getting ready to learn…and drink! On our last leg of the trip, we were stationed at the Hotel Piazza Carlina, a pretty hotel right in the heart of town. It even had it’s own lemon tree in the courtyard!! The next stop was at the Domori plant. The Italian heart of Domori is it’s None factory, in Torino, which was built to preserve the identity of the different varieties of cocoa while they process extra fine chocolate…it’s pretty amazing! And out last stop at the Giuliani caffe was such an amazing lesson in coffee…even as an Italian (who thinks she knows a lot about her beverage of choice), this was a great educational day! Like windows open to let the fresh June air in…I wonder what they’re cooking inside? Beautiful frescos that were on the walls of the town square…I bet the locals don’t even remember they’re there. But from a gal who comes from a relatively young country, I could stare at these all day! Oh, and all the doors! I loved this one because it was a door IN a door (can you see it?). Ah yes, Torino! You were a lovely place to see – an incredible backdrop to a fabulous trip shared with some pretty awesome people. A trip I won’t soon forget!